If you haven’t dove headlong into a mountain of pumpkin puree and eaten your way through to the other side, you haven’t embraced this wonderful season that’s upon us, my friend. No, not Fall… it’s Pumpkin Season! I just can’t help myself. Every year, sometime around the first or second week of October, about the time the weather starts to cool significantly in these parts, I get this wild look in my eye and my grocery cart becomes mysteriously filled with cans of that glorious orange-hued puree. Pumpkin is definitely the “it” squash come fall. Everyone is talking about it, its photograph is being snapped left and right, and everyone wants it at their dinner party. Bloggers everywhere are lovin’ on the pumpkin (including myself). Delicious recipes featuring autumn’s “golden” veggie have been popping up since September, and I’ve been happily (and literally) eating ’em up. Food blogs aren’t the only places glorifying the pumpkin these days. During my last visit to the supermarket, pumpkin made an appearance in all kinds of unexpected foods. I spotted pumpkin english muffins, pumpkin greek yogurt, and pumpkin flavored tortilla chips, just to name a few. Yup, there’s a pretty fair chance you’re riding on the pumpkin bandwagon right now. Consider yourself in good company! Pumpkin is good for your heart. One cup of pumpkin puree has about 7 grams of fiber, which is about 18-30% of your daily needs. Most is in the form of soluble fiber. Soluble fiber has a “gelling” effect, binding to fatty acids and thus decreasing cholesterol levels. Including pumpkin in your diet may help lower your risk for heart disease. Pumpkin reduces inflammation. A 2010 article in “Nutrition Research Reviews” concluded that consuming pumpkin can help reduce chronic inflammation in your body. Chronic inflammation can be brought on by anxiety, a sedentary lifestyle, and by eating too many refined oils and carbohydrates, or processed sugars. Over time this inflammation can lead to arthritis, diabetes, heart disease and cancer. Eating foods that reduce inflammation is also thought to combat visible signs of skin aging as well as acne. Some studies even show that chronic inflammation is associated with hair loss. Pumpkin is a rich source of beauty boosting antioxidants and vitamins. Pumpkin is an excellent source of vitamin A, with over 200% of your daily needs in one cup. It is also a good source of vitamin C, with about 20% of your daily recommended intake. It is also a particularly good source of beta carotene. Together these form a trifecta of free-radical fighters to help keep skin look young and supple, boosting collagen and smoothing wrinkles. 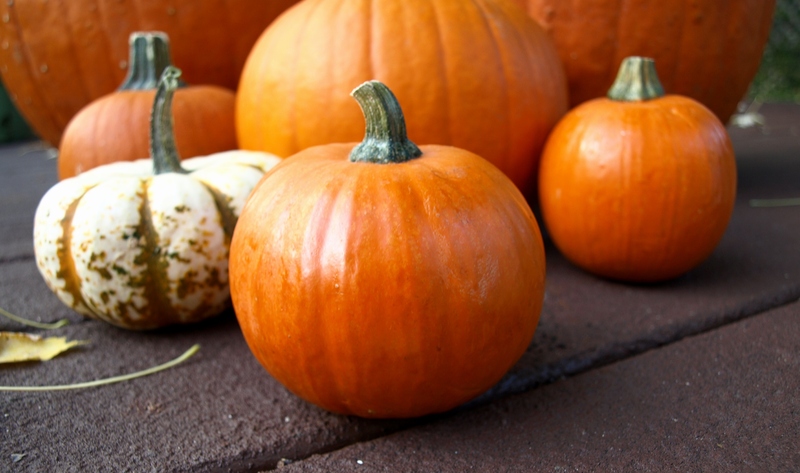 Beta carotene in pumpkin also helps protect our skin from damaging UV rays. Eating a diet rich in beta carotene has also been linked to lower rates of certain kinds of cancer. These antioxidants also protect your eyes from degenerative damage, keeping your vision sharp. Furthermore, they boost your immunity, keeping you well this coming cold and flu season. Pumpkin seeds could help improve your mood. Pumpkin seeds are high in the amino acid L-tryptophan, which is involved in the production of serotonin. Increasing serotonin levels can take you from bummed to beaming. They are also high in minerals copper, magnesium, phosphorous, zinc and iron. These minerals support healthy and younger looking skin and hair. Snacking on some pumpkin seeds can make you look and feel beautiful. Talk about a whole beauty food! As you can see, pumpkin boasts some pretty impressive stats. I’m beginning to rethink limiting my pumpkin obsession to just one season, and will be including this squash in my diet year round. In addition to putting pumpkin in your face, I would encourage you to try putting some on your face. When used topically, the naturally occurring fruit enzymes and alpha hydroxy acids in pumpkin help speed up cell turnover, revealing a brighter and more youthful complexion. I love mixing up concoctions in the kitchen and smearing them on my skin. My husband doesn’t even blink an eye anymore when I step out of the bathroom with some strange colored goop coating my face. My little one thinks it’s a riot, and can’t stop poking a finger at my cheek and smiling. I personally love DIY skin care because it’s inexpensive, effective, and uses healthy, safe ingredients. The following recipe makes enough for at least 3 uses and will last for about 5 days if stored in the fridge. 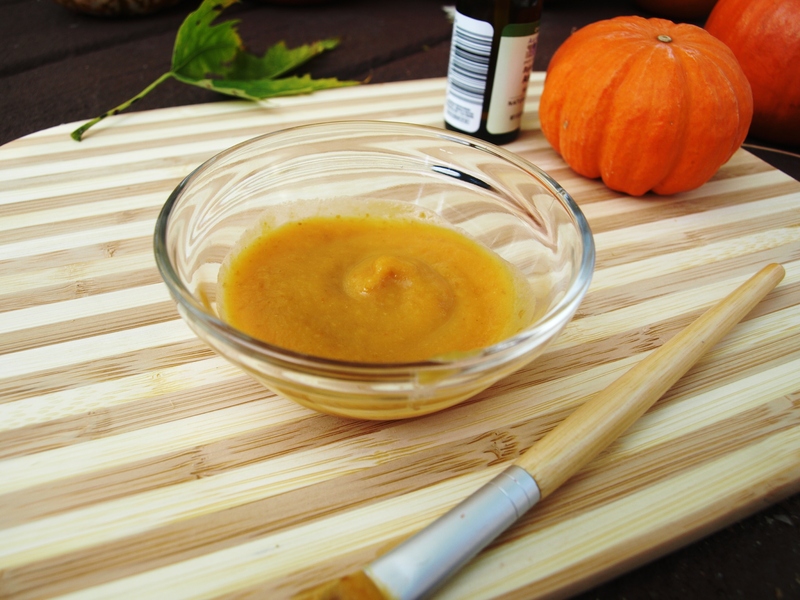 I wanted to add the power of probiotics to pumpkin for a super skin treat. The use of probiotics in skin care has been popping up in the news recently, and is thought to aid in the treatment of acne, eczema, wrinkles, and dryness. I noticed smoother skin and smaller pores after one use of my Pumpkin Probiotic Face Mask, and after three uses I am convinced my skin looks clearer, brighter, and more evenly toned. Give it a try and see for yourself! Happy Pumpkin Season! Mix all ingredients in a small glass container. Apply to freshly cleansed face with your fingers or a facial brush. Cover and store leftover mask in the fridge. Allow to sit on your skin for at least 10 minutes. Rinse with warm water and follow with a splash of cold water. Blot with a towel, leaving skin slightly damp, and massage in a few drops of pure jojoba or argan oil. Gaze with wonder at your natural beauty! Add a tablespoon of mashed avocado to the rest of the mask ingredients if your skin is on the dry side, to pump up the moisture. You could also try adding a handful of coursely ground rolled oats (just give them a whirl in your blender) when mixing up your ingredients, which will provide some exfoliation when you rinse the mask. You can use 1 or 2 probiotic capsules, instead of the powder, just open them up and pour out the contents. This mask is vegan-friendly if you use dairy-free yogurt or dairy-free probiotic powder (click on the links for my recommendations), and leave out the raw honey. Psst! Stay tuned for more pumpkin recipes coming soon!